There are many parameters which can be set in an EPC GEN 2 - compliant reader in order to optimize throughput; these can include: data rates, modulation type (both reader-to-tag and tag-to-reader), bit encoding, pulse widths and other air protocol particulars. It is beyond the scope of this posting to get into details of each of these but you can get an overview here. In fact there are over 128 combinations of settings on a typical EPC GEN 2 reader when you factor in all the variables; imagine trying to decide which ones to use when installing an RFID system and then having to change it every time the RF environment or reader requirements change! This is why Impinj offers a number of preset modes selected by Impinj system engineering to provide the best performance. The Speedway Revolution firmware (known as "Octane") supports several pre-configured Gen2 modes. In addition, Octane supports two mode settings that provide automatic control over the Gen2 Mode. This posting will describe some more detail regarding reader mode settings, what are the key differences between them and how to select, and set, the appropriate mode for your deployment. The chart below describes the static, pre-configured Gen 2 reader modes. 1. Not all modes are available on all models or in all regions. 2. As a rule, there is an inverse relationship between data rate and sensitivity/interference tolerance. Higher data rates generate, and are more susceptible to, interference whereas lower data rates cause less interference and are more tolerant of it. The second point above explains why a user may not (and most likely should not) always select "Max Throughput" mode. The name of this mode is a bit misleading, while it will support the highest data rate of any of the settings, it will not necessarily provide the best throughput or actual tag read rate due to interference and tag collisions. The term "Environment" in this case refers to the number of deployed GEN 2 readers, or other sources of interference, within the operating environment (defined by the EPC GEN2 standard as within a 1km radius of the reader). If most of the channels are occupied by active readers (for example, more than 25 readers operating in the 50 available channels in North America), then this is said to be a "Dense-Interrogator Operating Environment". If less than this, it is defined as a "Multiple-interrogator Operating Environment". Some regions do not allow for any mode of operation other than Dense-interrogator due to the limited available spectrum (and thus number of channels). In Dense-interrogator mode, the reader transmits using settings which will generate less interference but will not support the highest data rates. If deploying the Speedway or Speedway Revolution reader in a region which offers the choice of either of these environments, be sure to do a thorough site survey to ensure the operating environment will support settings other than Dense-interrogator mode. Please note that, in order to be effective, all deployed readers must be set to Dense-interrogator mode if necessary. If even one reader in a Dense-interrogator environment is set for Multiple-interrogator, it will generate interference which will negatively impact the throughput of all other readers in the environment. 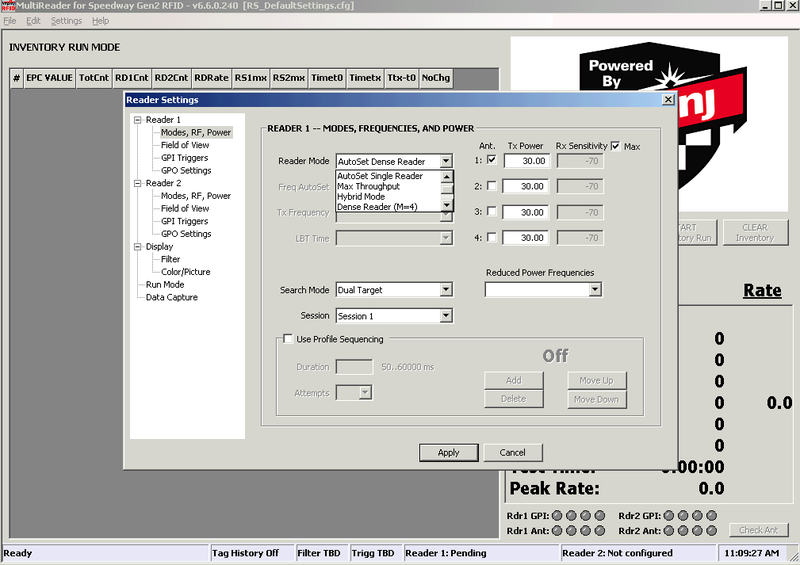 In addition to the modes shown in the chart above, the Impinj Speedway and Speedway Revolution readers offer mode settings whereby the reader adjusts automatically and dynamically according to the environment and measured throughput. These modes are designated AutoSetDenseReader (LLRP mode index '1000') and AutoSetSingleReader (LLRP mode index '1001'). AutoSet Dense Reader is both the preset and the normally preferred mode of operation for the Speedway and Speedway Revolution reader. 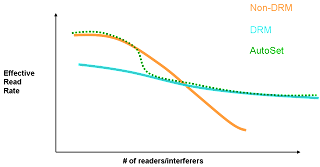 This graph below illustrates how the Autoset modes automatically adapt for the environment. The reader mode on the Impinj Speedway Revolution reader can be configured using a few different interfaces. One of these is the ItemTest graphical user interface. The other method is to use the Impinj Software Development Kit (SDK), if programming in C#, using the enum ReaderMode in the Settings class as shown below. The third option is to use the Low Level Reader Protocol (LLRP) implementation known as LTK. The LTK parameter "C1G2RFControl" in the Set_Reader_Config message sets the reader mode as shown below (see LTK Programmer's Guide for details). The Autoset Dense Reader is the default configuration on the Speedway and Speedway Revolution readers and, in most cases, is the best option. In instances where it can be assured that the environment is not Dense (no more than half of available channels occupied) then using Autoset Single Reader (in regions where available)should improve throughput while ensuring good sensitivity and interference tolerance. If greater throughput/tag read rate is required then it's suggested to work up through the options in this order: MaxMiller (where available), DRM8, DRM4 and Hybrid; select the first mode that provides an increase in throughput versus AutoSet. In very few instances is MaxThroughput recommended (i.e. anechoic chamber reading only a few tags).